Is Apple experiencing hiccups with GPUs on the next generation MacBooks? There are rumors that Apple will transition to Nvidia for certain Macs in the near future. In November, SemiAccurate claimed Apple won the bid to supply upcoming Ivy Bridge Macs. Another report popped up last month claiming Apple was eyeing Nvidia’s upcoming Kepler platform for next-generation Mac Pros. Apple now implements AMD after making the switch from Nvidia two years ago. However, a new report from SemiAccurate today claimed Apple will not include Nvidia GPUs in future low- and mid-range MacBooks, and it will instead likely go without a GPU and only a GT2 Ivy Bridge. Apple upped their SKUs from parts bearing awful Intel GPUs to variants with more of those awful shaders. Since those Ivy Bridge CPUs are going in to laptops that have a GPU, upping the shader count from 6 to 16 should be a waste, they will never be turned on. If they are going to be turned on, that would mean that the discrete GPU in those machines is either going to be much higher spec’d, or it won’t be there. Since Nvidia can’t supply enough small GPUs, what do you think the odds of them supplying the same number of larger and lower yielding ones are? There goes that option, leaving only one possibility, the next gen low and mid-range MacBooks are not going to have a GPU, only a GT2 Ivy Bridge. The report continued to claim sources indicated Nvidia could not meet necessary supply, which means the Macs would not include a GPU. However, Apple could likely go with Nvidia in higher-end Macs where Intel’s GPUs are not enough. It also claimed the middle-range of Macs might see some models with it and some without it. SemiAccurate ended its report by noting Nvidia’s and AMD’s GPUs used by Apple in mid-range Macs will likely be “dead forever” with Intel’s Haswell expected to win bids for Apple’s upcoming next-generation Macs. We are not entirely certain that Apple ever planned to use a discrete GPU in its mid-range MacBook Pros. While it seems that Apple is planning to move to Retina displays in its Mac lineup, which requires extra GPU hardware, Intel’s Ivy Bridge CPUs are growing exponentially better at doing graphic intensive tasks. In addition, Apple seems to be doing well with AMD GPUs in its high-end portables. 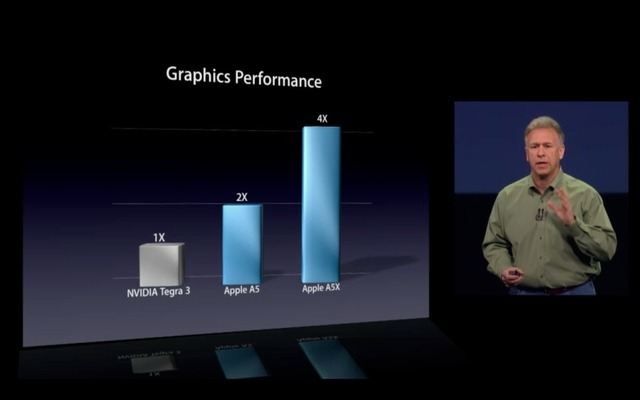 Moreover, remember Apple took a direct jab at Nvidia at the iPad keynote last week (below). That is not something partners generally do (Samsung notwithstanding).